Item set update and 50M+ Wildy Drop Party this weekend. News Item set update and 50M+ Wildy Drop Party this weekend. Since the update of Treasure Treasure trails we have quite an extensive collection of trimmed items that players can collect and trade. Having many items available creates a problem for buyers and sellers of those item sets, because they have to be parted out when they are placed in the auction house. We have decided to solve this problem by implementing item sets for trimmed and regular armor as well as for the trimmed robes. You can now create item sets by talking to an Auctioneer, who will take your gear in exchange for a single item set. Two types of armour sets are available, each set contains a Large Helmet, Plate Mail Body, Kite Shield and legs or a skirt. Item set with legs in it has (lg) in the name, set with a skirt has (sk). Rune armor sets have an option to create a set with no Kite Shield, this set has (no kite) in the name. Plate Tops will have to be converted to Plate Mail Bodies before they can be converted into item sets. Every now and then we have a player accidentally using an alchemy spell on one of his valuable items in inventory. We have made an update to High and Low Alchemy spells to solve this problem. Now if you use an alchemy spell on a high value item, you'll be asked if you really want to do that. The question is not sent for items that simply have a high alching gp value, but items like rares, trimmed armor and ect. have been placed into a special list. We have received a request that we add an option to set a idle time cap to 5 minutes if you're subscribed, so we have implemented a command ::idletimer, that will set your idle cap to 5 minutes even if you're subscribed. Veteran highscores are now available on our website. This weekend we will be holding our unique event, Wilderness Drop Party Massacre, this time the event main host is Anna aka Miles who is taking a break from RSCR, since he's heading to live in Japan from September, you can wish him best of luck here. Miles has donated his bank for our drop party and any events, so we'll be hosting a nice drop party for you all to enjoy! If you're not familiar with this particular event, here is a link to previous post about the party: here. Even though I don't have the items/gear to make sets with. I think this is a great update . makes organizing you're bank easier by reducing the clutter. 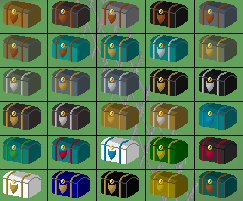 It would be cool to see this implemented across the board for resources ie herb pouch or satchel, jewelry box etc...just something to think about. Oh yeah, RSCR still has got it! If you would take some time to read the rules of the drop party, you'd see that the event area is a 1IP zone. Would be nice if you could make more than one set at a time, make option to make 1, 5, 10? That will be added in the future, thank you for the suggestion. Isn't that easily able to avoid, using a vpn tho? Can we implement potion sets and armor sets too? Herb, secondary, vial as a set. Maybe same for ores too. Like "unsmelted bars" or something along those lines. Well super set of potions would definitely be a nice addition, but making skilling related item sets, I don't know how much is that needed. Thank you for the idea though, will have something to think about. It sort of is, but it's better to implement a limit rather than hear complaints about certain pkers having obviously too many chars in the event. Also large part of our community is legit and will play fairly without a doubt. Well super potion set purchasing would be great, especially for stakers, but that may seriously hurt nooby herblaw trainers who would like to unload their attack or strength potions separately. Skilling sets is an interesting idea, will need to think about it, but i doubt we would implement it as you explain it here. Thank you for the ideas! It wont, by this time people search for the cheapest potions available with the search feature. SOMETIMES they just grab whatever is at the top of the list I have noticed too.